Get ready for a quad biking session of fun. Here you will enjoy a quad biking experience with a difference. Various trails are available to suit those of all abilities. Test your abilities whether beginner, intermediate or advanced. The emphasis for this quad biking experience is full adrenaline pumping fun! No party poopers just 100% adventure. Quad biking is a fantastic opportunity to really blow your hair back! If you have never quad biked before, you may feel a bit shy at first, but before you know it, you’ll be ramping all over the place just like everyone else. This is a great activity for the adventurous as well as those who enjoy sports and nature. You are guaranteed an exhilarating experience as well as the opportunity to breathe some much needed fresh air. Learn some new techniques, scramble to your heart’s desire but most of all HAVE FUN! Quad Biking is guaranteed to put a smile on the stiffest person’s face….whoever that may be. Availability | Rides take place from Tuesday - Sunday. Who | Ideal for everyone (no experience necessary). Children can pillion with parents. Numbers | This experience is for one person and may form part of a group. Large groups can be accommodated. Weather | Quad biking takes place no matter the weather. What to take | Wear sports clothes and closed shoes. Helmets will be provided. Additional Information | Participation is at your own risk. 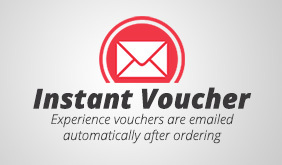 This experience includes a nominal service fee and e-voucher. We had a lot of fun thanks! We initially thought the guides will hold us back, but they were not waiting around! :-) Thanks for your help in making this happen. I'm sure we'll be speaking again soon!